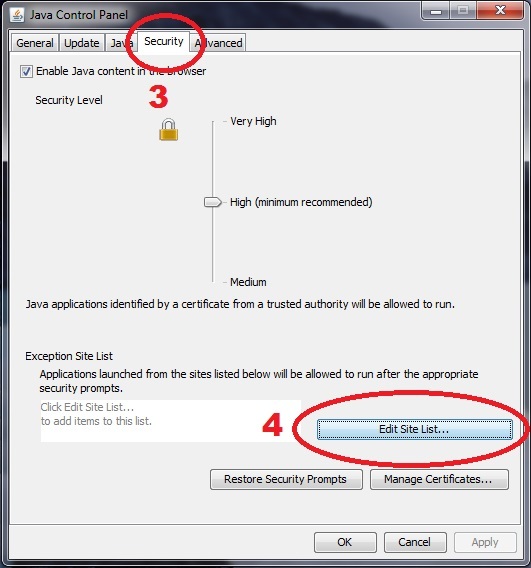 emps-world.net to Java's security exceptions. I've written a guide to take you through the required steps. Since Java 7.51 they have decided that Java applications cannot be run anymore unless they are signed off by a trusted authority. Sounds great, doesn't it? Yes, it sounds awesome, but signing the client by a trusted authority costs $200. In the end it's just a money rip-off for developers. 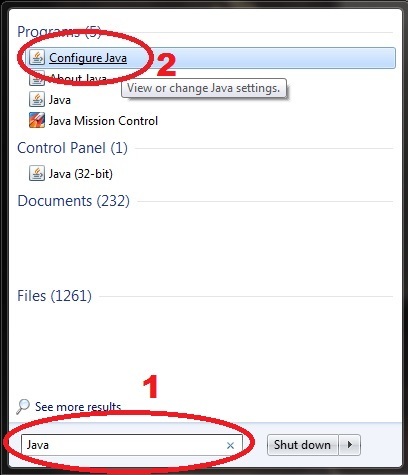 1-2: Search for Java on your computer and find: Configure Java or Java Control Panel. 3-4: Click on Security and hit the Edit Site List... button. 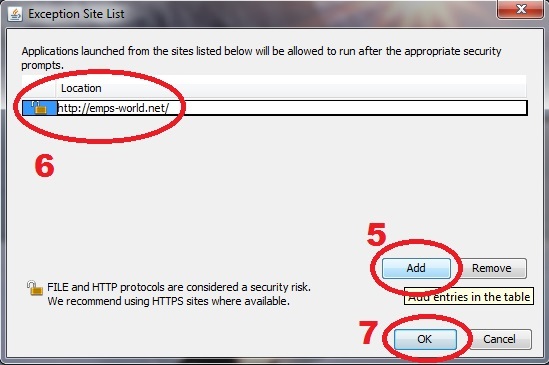 5-7: Click on the Add button and enter http://emps-world.net/ in the Location field. 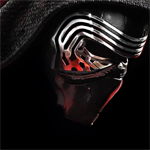 Please make sure that you enter EXACTLY http://emps-world.net, else it WILL NOT WORK! Then hit the OK button and you're done. 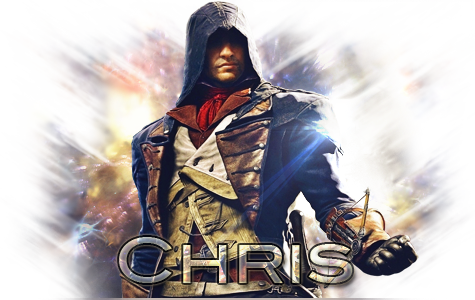 8: Head over to http://emps-world.net/play and see if it has worked. If you still cannot get the webclient to work, please just post here and we'll do our best to help you. Well if it is possible to post the pictures, How to do the same steps with MAC, It would be great. moreover the desktop client doesn't work for me either, it says: "Emps-World.jar" can't be opened because it is from an unidentified developer. You definitely got http://emps-world.net/ added to the exceptions? I'm sorry, but you need to wait until I get a MAC. even though this is simple to do I think that it's going to effect the instant access to the game for the incoming vistors thus the players base. afaik you're capable of Signing and Verifying the Client Thomy. Edit: sorry, I just read the second paragraph. $200 isn't much to spend, for the loyal emps-scape players who came back and still want to play. Yeah I did all that. Unfortunately, the webclient still doesn't work. After you click the option to "Run" the client, it just goes to a blank white screen. Hopefully you'll be able to test the client on a Mac soon though. For the desktop client, you have to go into your "Downloads" and right click on "Emps-World.jar" and click on "Open With >" and click on the "Jar Launcher.app" to open it. However, after the ClientLoader completes loading it, the client doesn't appear. I think it's a problem from this server only for mac, Since i tried another server and it's works fine. Could you please check if there's a problem or something? and dont know how to fix it, you are either retarded. Or you dont have a mac. Or you have never installed a program thats not from apple store.